We've all heard stories of the dropout that makes billions--a triumph relying more on luck than skill and never to be repeated. In real life, successful entrepreneurs take classes, write business plans, and map out every contingency. But if the stories are such a fluke, why do we hear them over and over again? In The Entrepreneurial Instinct, sought after small business expert Monica Mehta looks past the rags to riches stories to explore the role of mind, behavior, and brain chemistry in our ability to be successful entrepreneurs. Interviews with entrepreneurs reveal the traits and habits that allow them to thrive. Groundbreaking insight from neuroscience and psychology experts uncovers the scientific explanations behind self-made mavericks' seemingly innate knack. The Entrepreneurial Instinct weaves together the incredible self-made stories of the founders of CLIF Bar, Carol's Daughter, Marquis Jet, Skip Hop, KIPP Charter Schools, J Brand, Tahari, Apple, Paul Mitchell Systems, and Dogfish Head Beer. None of these anecdotes involves higher education, meticulous planning, or years of gathering seed money. These stories are about seemingly average people who possessed a keen understanding of how their minds worked--and used that knowledge to their advantage. In a time when the prospect of unemployment or the loss of life savings is high, the need to seize control of your own destiny is greater than ever. The Entrepreneurial Instinct offers much-needed techniques for using our innate capabilities to make more with less. Now is the time to learn what you're made of. Now is the time to make your move. Now is the time to tap into your Entrepreneurial Instinct and create your own story of small business success. "Monica Mehta's book is a must-read for anyone aspiring to excel by challenging conventional wisdom and rolling with the punches to do what comes naturally." "Illuminating and rich case-based insights into the physiology that drives entrepreneurial risk-taking and decision-making." "I couldn't put this book down. The author does an outstanding job drilling down to unearth exactly what allows some to risk life and limb to create something of value, a feat that should ignite interest in many. Highly recommended reading." 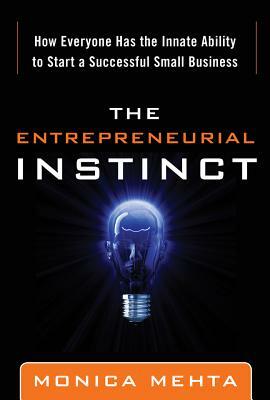 "This book gets rid of the last excuse of the would-be entrepreneur: fear. By showing how you can work with your brain chemistry rather than against it, The Entrepreneurial Instinct helps you take smarter risks with less angst. It obliterates a lot of the conventional wisdom around entrepreneurship and shows what it really takes to succeed." "I found this book absolutely fascinating. The science behind success is rarely discussed and certainly not in such an entertaining, relatable way. Great book--read it "
Monica Mehta is an investor, an author, and a small business expert with 15 years of experience operating multimillion dollar consumer businesses and advising hundreds of entrepreneurs. She is a managing principal at New York-based investment firm Seventh Capital and frequent contributor to Bloomberg Businessweek, Inc. magazine, Fox News, Fox Business, ABC News, and MSNBC. She is a graduate of the Wharton School of the University of Pennsylvania.